My first blog and a chance to enter my Giveaway to win a personalised Letter Art, a unique illustration just for you! I am absolutely delighted to say that my website is now being updated and one of the things I am going to do is to be making a very decided effort to post a blog or two on a regular basis for you to show you some of the things I create. I hope that we can get to know each other better as well and you can get to know a bit more about me and the story about my art and where my ideas come from. 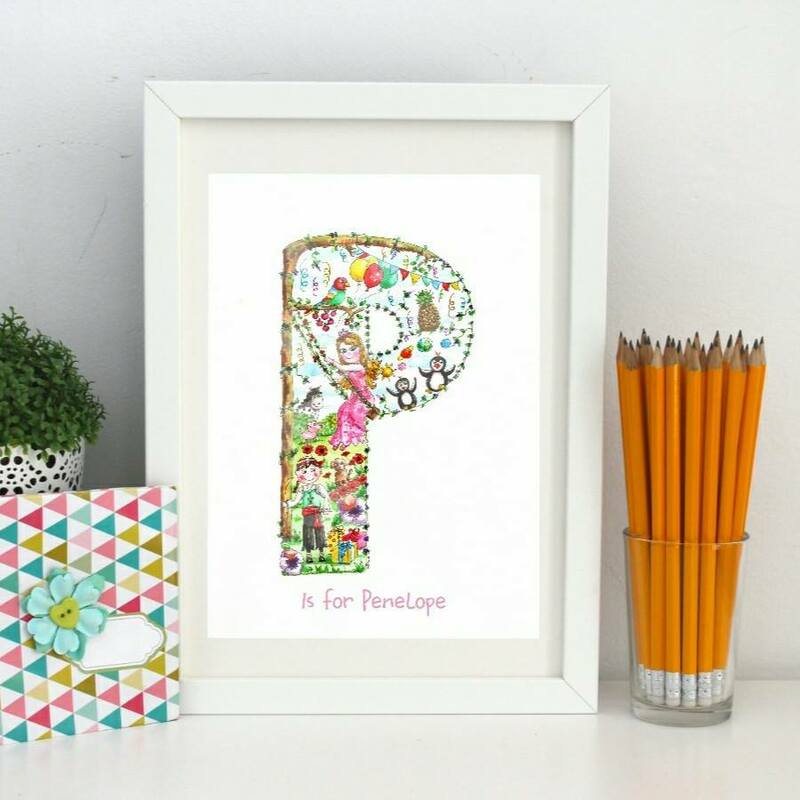 I am also going to be offering you a chance today to enter my prize giveaway to win your very own Alphabet Letter Art, personalised just for you! More details of how to enter are at the end of this article. 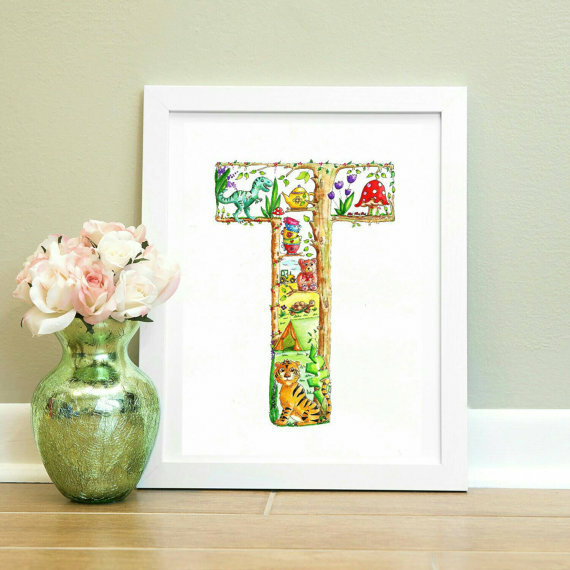 One of my very favourite pieces of art to create is my alphabet letters. This is currently a long and very happy project where I am slowly but surely, working my way through the alphabet letters. 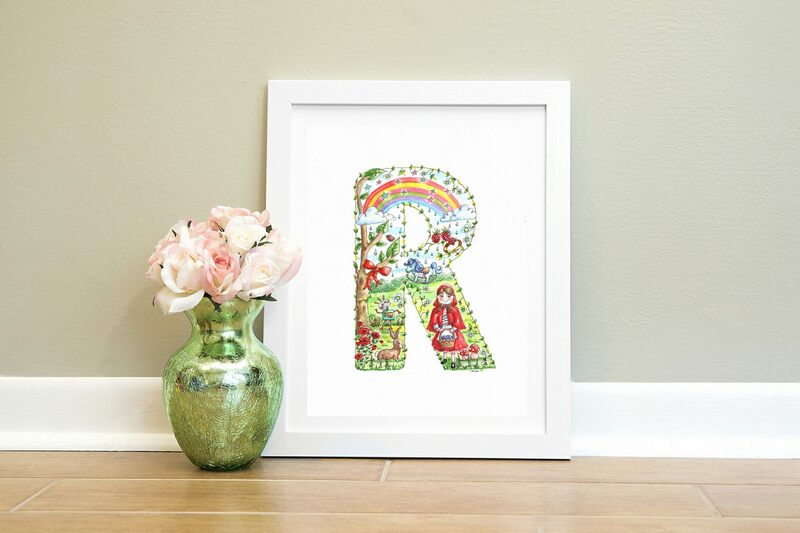 The letters are a joy to design and they are a bespoke piece of artwork, commissioned by my lovely customers, who I work closely with to create a piece of art just for them and their family. What are the Alphabet Letters and what are they made from? 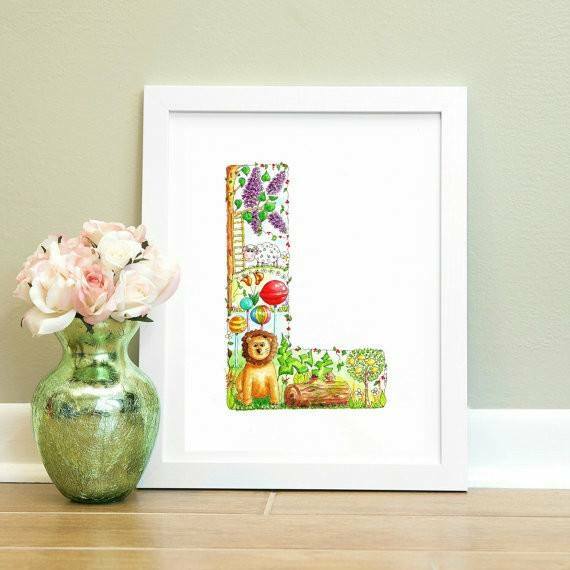 My Alphabet Letters are giant letters drawn and painted in ink and watercolours. They are always full of different and fun colourful items. I feature items that begin with the letter itself or I have a theme such as my Alice in Wonderland letters. They are approximately 14” by 10” in size and look beautiful when they are framed. 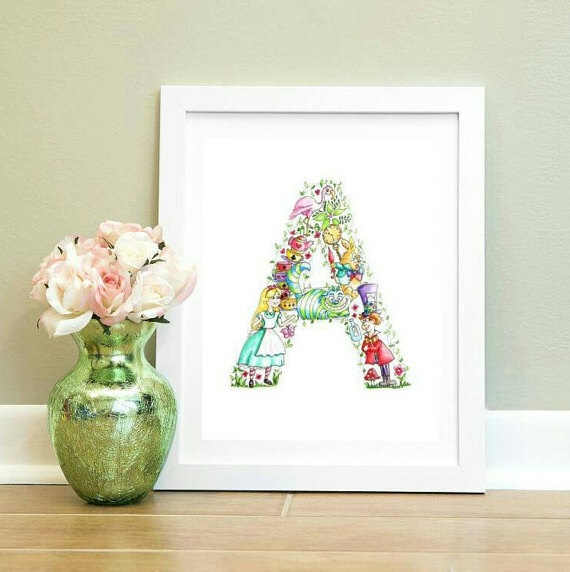 The Alphabet Letters are a follow on from my Name Art where I create bespoke art design based on names for individual customers. 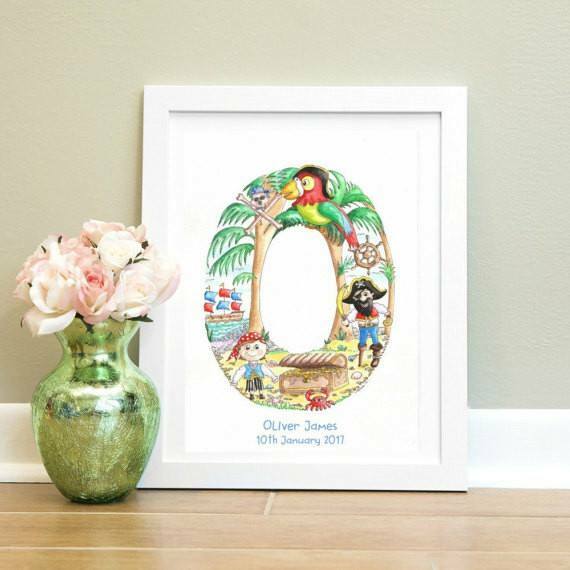 My ultimate aim is to create the whole alphabet and then I will be able to add them onto my range of birthday cards and door signs. I am very lucky to have an amazing group of followers on my Facebook Page and they all love helping me out by sharing their ideas with me and they usually come up with the best ideas! I also do my own research, looking for information about animals and looking at photographs which give me inspiration and ideas. Other ideas also magically pop into my head too and I capture them in my artwork. 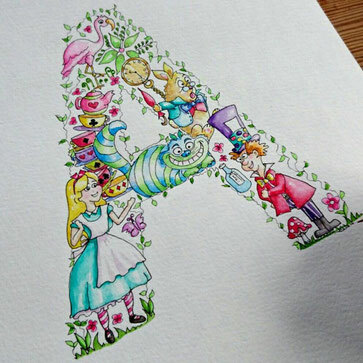 My favourite letter has to be “A” for Alice in Wonderland as I have always loved those stories from being a little girl. I wanted the opportunity to add my own fun, quirky style to such a classic story and I love the array of colours that I have used in this particular design, especially the teal colour. I always try and help customer’s decide what they would like to include in their letter. Sometimes, they may be stuck for inspiration so we talk about their favourite colours, I ask them what pets they may have in the family or favourite flowers and trees do feature quite a lot in these pictures. I also add in mum and dad’s occupations (if they are for the children) and anything else that might be special and represent the family. Initially, I will sketch out a piece for the customer to show them and then they can discuss the design with me. I can then make any alterations they want before I start to paint and complete the detail. I am running a very special competition to win one of my letters! The letter will be specially personalised for them in a design of their choice. It will be personalised just as I have described. 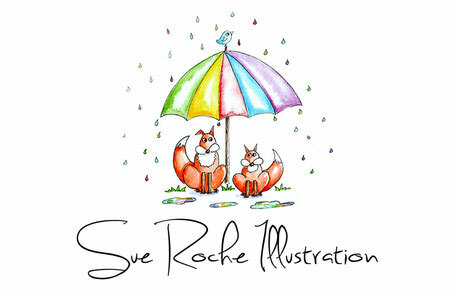 It’s really simple to enter, all you have to do is sign up to my monthly newsletter to be in with a chance of winning! The competition runs from Friday 14th April to Sunday 14th May 2017 and a winner will be picked at random from my list. They will be advised by email that they have won and then we will discuss the next steps to creating a unique letter for them. The prize is valued at £75 so it is an amazing prize to win and totally unique too! Postage is included if you live in the UK. So, if you would like to be in with a chance to win, the click below to enter now! Good luck! On 15th May 2017, I am absolutely delighted to announce that we have a winner! 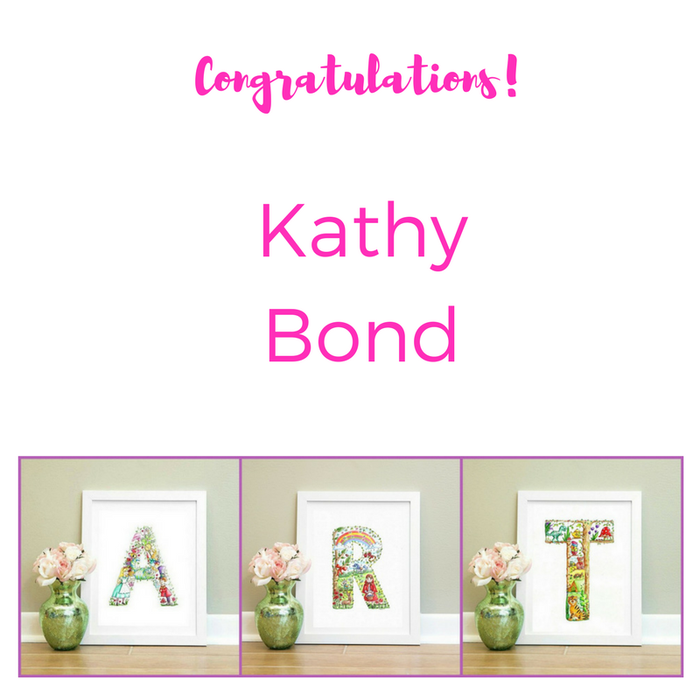 Congratulations Kathy Bond. The winner and other competition entrants have been advised of the result which was selected at random from a number generator.